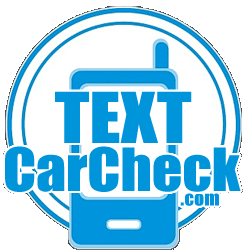 Car Text Check Service – Peace of mind when buying a new car from only £3! SO, you’ve got the big red pen out and circled a few of your favourites in the AutoTrader or local newspaper. You’ve even gone online and searched through hundreds of used cars before finally setting your heart on one. It can be exciting when you’re getting a new set of wheels, but before you part with what is likely to be a hefty amount of cash, shouldn’t you do your homework first? Okay, it can be time-consuming and boring compared with the thrill of driving away in your new motor, but checking a used car’s history can save you a lot of heartbreak further down the line. TextCarCheck.com can help conduct a quick and easy HPI check on any used car, arming you with the information you need to make the best decision about which car to go for – and which to avoid. Get a comprehensive vehicle text check now! We supply vehicle history and data checks and a quick text to us can unlock a wealth of information about any used car. Just text “CHECK” + your reg to 78888 and you’ll get a deluge of details about the car you have your eye on. Has the car been written off by an insurer and what category of damage does it fall into? Has it been reported as stolen to the Police? What is its mileage history? Has the colour or number plate been changed? What is the chassis/VIN number and has it been cloned? Has the car been exported or scrapped? What is the ownership history of the vehicle? You’ll be able to access a full report which you can download straight away and which contains over 70 information points about the car. A full HPI style used car check costs only £3. But we don’t just bombard you with the information and leave you to fend for yourself. All our text car checks are backed up by UK-based phone support system so we’re only a quick call away should you need us. 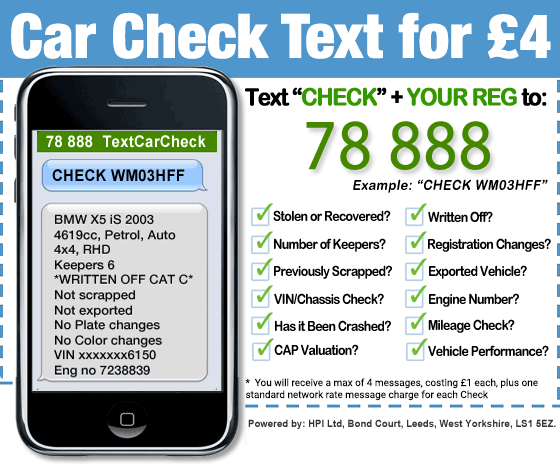 A quick and easy car text check with TextCarCheck.com can reveal if a vehicle has been previously written-off. If you don’t carry out a registration check and find a couple of minor faults on the car, you may think that it’s nothing your local mechanic can’t iron out. However, a trip to the garage may reveal that the car has been in accident in the past and written off by an insurer. A car which has been written-off, but sold on can be very dangerous and you will not only be putting yourself in harm’s way by driving it, you could also endanger other drivers. Insurance companies write off almost 500,000 cars every year. Many will end up as scrap, but some are patched up and sold on. A car data check can unearth the potentially dangerous secret a used car is hiding. The joy of whizzing around in your new motor can be short-lived if you discover that the car you have bought has been stolen. The Police National Computer provides TextCarCheck.com with information on cars which have been reported stolen. When you perform an HPI text check with us, you’ll be able to find out if the police have received a report that that car has been stolen. Failure to carry out this check means that, if you do buy a car which turns out to be stolen, you’ll end up without any wheels and without the money to replace it. Don’t get stung, get an HPI text check before you hand over your hard-earned cash. No matter what an unscrupulous seller might do to pass off a cloned car, a quick and simple car data check with TextCarCheck.com will uncover it as a stolen vehicle. When a stolen car has been altered in some way and an attempt made to make it look legit, this is called a cloned car. But each car has something unique to it – the chassis/VIN number – which an HPI text check will give you in an instant. Buy a cloned car, and you’re back where you started. Actually, you’re further back, because not only will you not have a car, you’ll be seriously out of pocket too. If anything looks a bit fishy to you about any vehicle, don’t hesitate to get car data check done straightaway. It doesn’t matter where you are – a used car showroom or down the cafe flicking through the motoring section of the newspaper – you can get an instant car registration check done anywhere thanks to our mobile app. All those vital details are literally at your fingertips. Just punch in the information and you’ll have over 80 information points available to you about the car in a matter of seconds. There’s also a full search and registration history, so you can store your favourites and compare different used cars across a range of criteria. You can perform a car data check with the make and model, registration or VIN number, meaning you don’t have to be in the dark about your potential new wheels. All you have to do is text “CHECK” + your reg to 78888 and you’re on the road to discovering all you need to know about that used car you’ve had your eye on. Copyright © 2017 TextCarCheck.com. All rights reserved.